CHARLETON, W.Va. — When the 2019 legislative session started, Gov. Jim Justice, Senate President Mitch Carmichael and House Speaker Roger Hanshaw all promised tax reform and money for education, state employees and PEIA. Monitoring those legislative goals will be a session-long project for the West Virginia newspaper industry. West Virginia Press InSight’s Betsy DeBord and Tom Hunter will provide regular updates on the status of promises made by the Governor and leadership of the state’s Legislature. As the session nears the mid point, numerous bills addressing the leadership’s goals — along with hundreds of other bills on a wide variety of issues — are moving through the legislature and committee discussions are heating up. With the number of bills increasing, DeBord and Hunter share tips on how to track bills. To assist all readers, this video clip offers tips using WVLegislature.gov website. 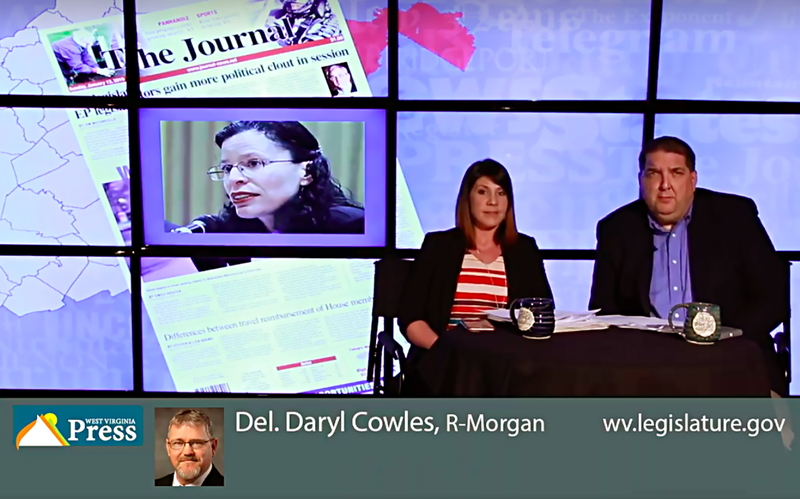 WV Press InSight is the newspaper industries’ video news service, offering three-minute segments on various topics during the legislative session. Readers can visit this newspaper’s website, Facebook page or visit @WVPress on Facebook to see the videos. The video show also features an “InDepth” interview, conducted by WVPA executive director Don Smith. In this episode, Smith speaks with Charlie Burd, executive director of the Independent Oil & Gas Association of West Virginia, about legislative impacted the natural gas industry and gets an update on the proposed cracker plant near Moundsville, W.Va. Rumors at the State Capitol have U.S. Senator Joe Manchin running for Governor in 2022 again Governor Jim Justice, who announced his re-election campaign the week of his State of the State. Manchin would also face a primary challenger in Stephen N. Smith, a Democrat, who is the former director of the West Virginia Healthy Kids and Families Coalition. The growing political influence of the state’s Eastern Panhandle. With powerful committee chairs in both the House of Delegates and State Senate, representatives who once felt they were not heard at the W.Va. Legislature, are now running the meetings. — The legislative session won’t last forever, so WV Press InSight is offering readers information on the state parks around West Virginia. In this episode, DeBord provides tips on using the new wvstateparks.com website. For more videos and legislative coverage, visit wvpress.org and @wvpress on Facebook. WV Press InSight: Bills on free community college, elimination of Social Security tax stalled in W.Va. Legislature? WV Press InSight: Could suspension of WV legislative rules impact teachers pay raise bill?